Microsoft is bound and determined to get rid of Control Panel in Windows 10 and replace it with Settings. But not so fast. Not so fast! Many Control Panel items are still not included in settings, so it looks like Control Panel will be around a while longer. And, if you use Settings a lot you’ve probably noticed when you click certain items in Settings, you end up in Control Panel anyway. Someday, Microsoft will eventually get everything moved out of Control Panel and into the Settings app, but as now they are not close to getting that done. The geeks call this “deprecating” Control Panel. Since Windows 10 Creators Update *Version 1703* Control Panel has been removed from the Win X menu (right-click the Start button – that’s the Win X menu, which can also be launched by pressing the Windows Key + X). You can access Control Panel without a shortcut. Just type CONTROL in taskbar search and press Enter. Control Panel will open. 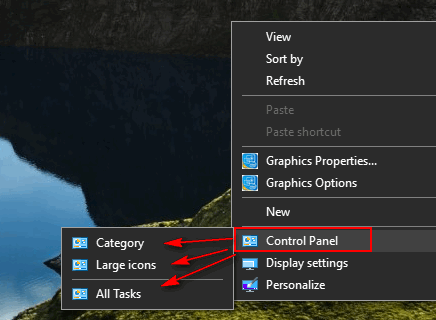 While Control Panel is open, you can right-click on its icon in the taskbar and choose “Pin to taskbar” if you want a permanent shortcut to Control Panel on your taskbar. Notice that this works on the very latest version of Windows 10 (Insider Preview Version 1809 build 18305) and it also works on Windows 10 Version 1803, Version 1709 and earlier versions of Windows 10. If you download and run our reg file (link below), you’ll have Control Panel, and the options shown above, on your desktop right-click menu too. Once you’ve downloaded it, unzip it, then double-click it on the file named ControlPanelContextMenu.reg . 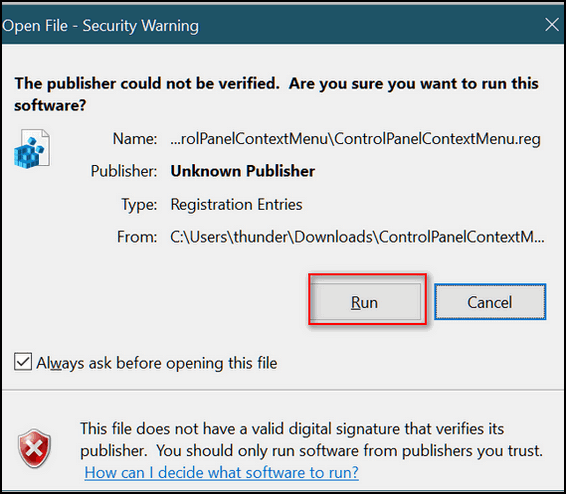 You’ll need to click Run on the warning to allow the Registry Editor to open. Then you’ll get another warning telling you that you can really mess up your computer monkeying around in your registry. If you want Control Panel on your desktop right-click menu, you’ll need to click “Yes”. If you did everything according to the instructions above then you’re good to go. From now on, when you right-click on an empty place on your desktop, you’ll see Control Panel in your right-click menu with the options to open Control Panel in Category View, Large Icon View, or as a list (All Tasks). We, as older folks, prefer Large Icon View. Easier on the eyes. Thank you for the tip. We find that the All Control Panel Items is even more useful than the Control Panel. Consequently, do you have a tip to put All Control Panel Items in the context menu. 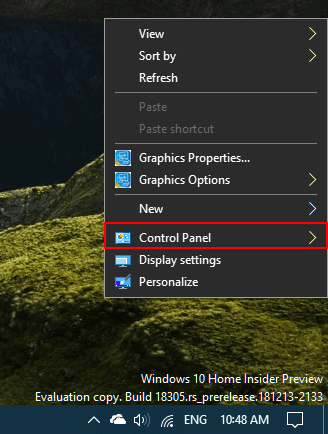 Furthermore, do you have a tip on how to put the All Control Menu Item on the Task Bar, as Windows 10 doesn’t seem to allow you to do this, as far as we can ascertain. The best we have been able to do is pin the item to the jump list of the Control Panel on the Taskbar. Thank you if you can help. Not sure I understand your question. There is not such thing as “All Control Panel Items” Your choices are “Category”, “Small icons” and “Large icons”. Both small icon and large icon views show you a list of all control panel items. Creating a shortcut on your taskbar will open to the way you opened the control panel as it was opened the last time you viewed it. As for the “right-click” menu, you have 3 choices: “All tasks” a list of all items and sub-items; large icon view, list of all control panel items; Category view which groups all control panel items into groups. Not sure what kind of list you want as Large icon view is a list of all control panel items. If you want a more extensive listing you can create a so-called “god mode” shortcut.http://www.thundercloud.net/infoave/new/empower-yourself-on-windows-10/”> Instructions for that are here. Thank you. You have clarified the Control Panel options for us. Your larger view of the nuances and intricacies of Windows 10 has, once again, been highly informative. Thanks so much! I now have the Control Panel pinned to my taskbar and love the ease of finding it again in a simple and direct manner. You guys are TOPS! You are wonderful. Simple as falling into a vat of jello. It works! I did everything right, but Control Panel does not appear on my right click menu. Sorry Cindy, it is a standard Windows reg file that works if done correctly and you’re logged on as admin. We’ve tested it on many computers and it works. Sorry it does not work for you.